Is Global Warming Ardor Cooling? The Gallup Organization surveyed 1,000 adults across 111 countries in a recent round of its surveys. Gallup repeats questions periodically to see the trends in changing opinion. The result of this latest round of surveys does little to settle the debate over global warming, but it offers both sides something to use to advance their arguments. 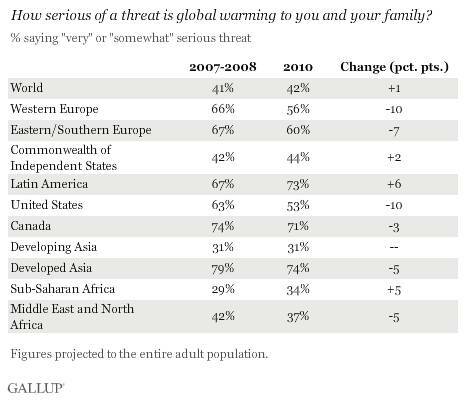 While the worldwide average response has changed little over the past few years, 42% today versus 41% in 2007-08 when the question was last asked, say global warming is a serious risk. What is different is that the Europeans and Americans who sought and failed to win support for international agreements to reduce greenhouse gas emissions at the Copenhagen conference and failed again a year later in Mexico City have cooled on the subject. Like an old romance, the passion for global warming action has mellowed with the expectation for action in the EU and US down 10% in the Gallup poll. Perhaps, the global warming issue has been tarnished by scandal over climate change research. Perhaps, failure of Congress to enact a cap and trade bill was a factor. Perhaps, the recession and global priority of digging out of the financial hole reduced the appetite for the carbon tax and wealth transfers envisioned. The developing countries, on the other hand, which stood to gain financially from the COP15 proposals still lust for the revenue it once promised and so they maintain their resolve that global warming is a serious threat. Perhaps, this is a genuine fear in response to the global hype we have been exposed to for the last decade. Perhaps, it owes to the sometimes desperate need for economic growth and income and a perceived loss of transfer payments. Perhaps, it is a form of projection transferring the responsibility for local problems to the global stage. Based upon Gallup’s latest results, global warming ambitions that once were red hot are being replaced by slow, steady progress in research, new technology and a nation-by-nation duty to take care of our respective corners of the planet. This entry was posted in Environment and tagged Climate change, Gallup Organization, globalwarming, Greenhouse gas. Bookmark the permalink.